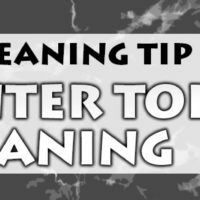 Cleaning is a chore…there’s no denying it and if there’s one thing people like it’s finding the easiest way to get the job done. We’ve searched the interweb far and wide for the most clever and funniest ways someone’s cleaned the house. If the kid’s going to be crawling around on the ground you might as well try to get them to clean. The Baby Mop has surprisingly wonderful reviews so maybe this isn’t such a wild idea after all. “My floors have never been cleaner; the only problem is that my child has outgrown the suit and I am having to rent children from the neighborhood to keep the floors clean.” – Victoria G.
Desperate times call for desperate measures! When the pet hair just won’t come off the furniture it’s time to pull out the big leagues: Duct Tape. “Sure, the tape idea worked but I’m still finding sticky residue on my couch. Was it worth it? No. Was it kind of neat seeing my whole couch covered in tape? Yeah, a little bit.” – Mandy M.
Toilets can get pretty grimy and cleaning them is no fun…but maybe with a drill and toilet brush it can be? “In theory, this idea sounds awesome. I thought I was a genius, but the drill had a little more power than anticipated and the tape I used to hold the brush on didn’t quite do the job. Long story short I had more cleaning to do after the whole debacle.” -Connor G.
These ideas are…maybe not the best. When you’re looking to get the house really clean sometimes it’s just better not to take any shortcuts. We will let in on a little secret though, the easiest way to clean is with Maid to Shine! LOL! I especially love the soap angels! I wanted to try that out, but my wife said no. Awww you could always suggest one of the other unconventional cleaning hacks to her. Who knows maybe she’ll let you put a toilet brush on a drill bit haha! Clever way of doing chores! I love these life hacks. Thanks for sharing. You’ve got humor. Superb fun cleaning ideas. I really loved it. Thanks for sharing. When the kid is crawling, every parent should be careful. Because our little ones not only crawl and breath dust if it’s there but also put different things in their mouths. So we should clean our house often and keep everything in order. I even bought a vacuum cleaner with HEPA filter. It traps the dust so it’s not coming out in the air again. I’d suggest you do the same. Because allergens can be everywhere! Any “clever” ways for car cleaning? E.g I like use dish soap instead of special soaps for car. AMAZING Love this particular!! I like the tower as well as soap angel way, that is really a good cleaver method to clean!! Smart way of performing chores!! Thank you for this beloved!! I really loved your cleaning ideas and the way you performed chores. Thanks for sharing such a wonderful blog.